So assuming acupuncture helps with allergies, where exactly are those spots where needles (or even fingers) are placed? Depending on the acupuncturist you see, there may be slight variations, but here are the usual 7 spots. Keep in mind that there may be numerous other locations that may be treated as well. Either needles (which works best) or finger acupressure can be used. The first 6 are all located on the face (see pic). 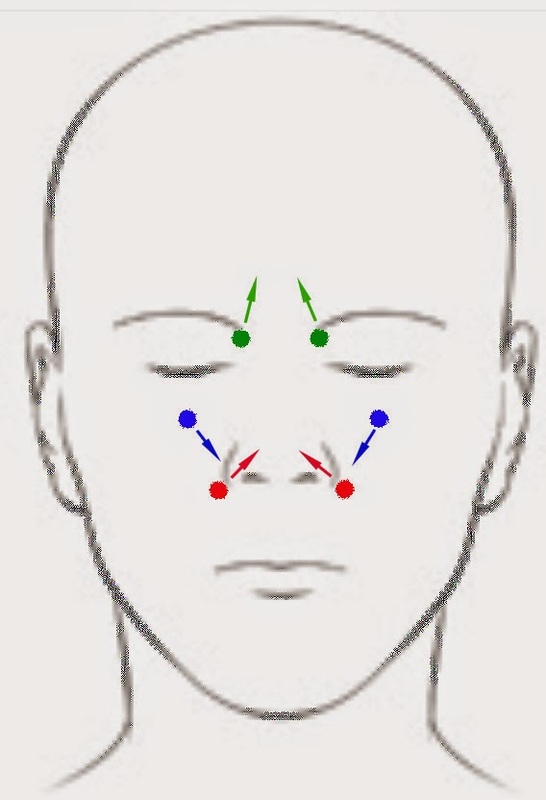 A person can easily self-administer acupressure correctly on all six points on the face using both their hands by placing the pinky on Large Intestine 20 (red), ring finger on Stomach 2 (blue), and middle finger on Bladder 2 (green). 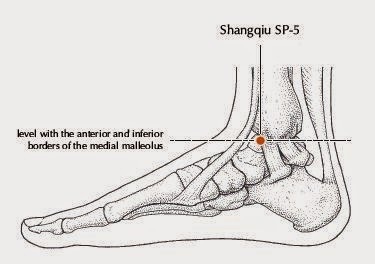 Somebody else will have to press at Spleen 5 (left ankle; see below). The arrows demonstrate the direction the pressure should be exerted. • Large Intestine 20 (Red): Located just outside the nostrils. Acupressure with finger should be pressed diagonally upward, as if you’re aiming for your eye on the opposite side. • Stomach 2 (Blue): Located just below the eye where the bone indents inward. Acupressure with finger should be pressed downward toward the mouth. • Bladder 2 (Green): Located on the inner end of the eyebrow. Acupressure with finger should be pressed upward towards the top of the head. The seventh location is on the LEFT ankle (Spleen 5). • Acupuncture works better than acupressure. • Acupuncture works better if administered BEFORE allergy symptoms occur as a preventative measure. • Acupuncture can help minimize allergy symptoms even if you miss the preventative window. • Acupuncture is especially helpful minimizing nasal drip, itchy eyes, and sinus headaches. It is not uncommon for people to notice an immediate clearing of the nasal passages after receiving these seven acupuncture points. If acupressure is used, enough pressure should be exerted such that it "hurts good" and the pressure should be sustained for about 5-10 minutes. I've been to several acupuncturists, but none have ever taken the time to really get at the heart of the issue. Guy from TCM Mississauga spent a good amount of time discussing the issues and the treatment and then we got started.